It has been a busy week for the Greendale team with Tony in Sydney for the Sydney Easter Sales. But there is certainly a buzz in the air with the lead up to a fairly action packed weekend with runners in 3 States on Saturday, including Varenna Miss in the Group 1 TJ Smith and Amalgamate who takes a big step up in class when she takes on the 3 year old fillies in the Group 3 Schweppervence Stakes at Morphettville. Our forever honest mare Our Spirit’s Bay returns to the track at Flemington in the Open 1200m after having a little freshen up and Paramour heads to Hamilton after his first up win at Mornington and then Mateo heads there on as he gets ready for the jumping season. Brien’s Girl also lines up at Cranbourne on Friday night in the 0-62 1500m event, and we hope for an improved showing from her this time. 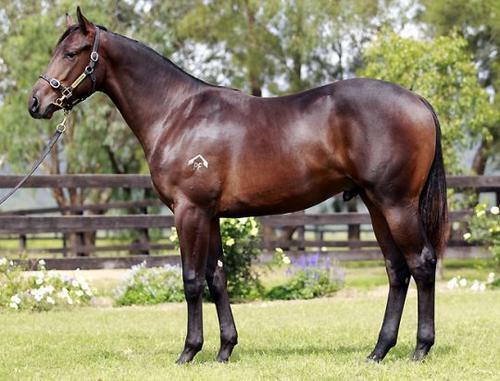 News from the Sale ring this week, Tony walked away the successful bidder on 3 lots; Lot 552 the Authorized / Whistle Dixie Colt a bargain buy from the Torryburn Draft for $25,000, lot 338 the stunning colt (pictured) by Lonhro out of the half sister to SO YOU THINK, Pride’n’Prejudice, and Lot 575 a colt out of Chandon Rose making him a half brother to our very own WA Oaks Placegetter, LADY SEA, by triple Group One winner Haradasun (Fusaichi Pegasus) who was represented by his first winner when the filly Hot Fever (2 f ex Campbell Fever by Bluebird) won on her debut at Ballarat this week. Overall the Easter Sale finished down on the 2011 figures, despite having a top-priced lot sell for more than double that of 2011. The gross of $72,825,000 is down marginally from $74,240,000 in 2011 from 20 more lots sold. The average of $220,682 is down nearly seven percent from last year’s $239,484 with the median of $160,000 down more than ten percent on 2011’s $180,000. News from inside the stable.. Stable Foreman Viv Betrand had a birthday on Friday, he will not disclose which one we were celebrating but we all wish you a very happy birthday Viv and hope we havent aged you too much! Have a great weekend and best of luck to all our connections with runners over the weekend!